This snowflake... well, I'm sure the center will speak for itself - even more so when you take a closer look! The ornate clover pattern is entirely natural, but seems too elegantly detailed to be created by nature. I assure you this is Mother Nature at work in the best possible ways. 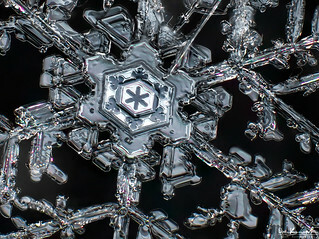 You can tell that this snowflake started it's life slowly, gathering water vapour into it's structure very patiently. This created the big, blocky center. Then at some point the amount of vapour became more abundant (or some other variable changed) and it started rapidly growing branches and threw symmetry out the window. Such is the life of a snowflake.